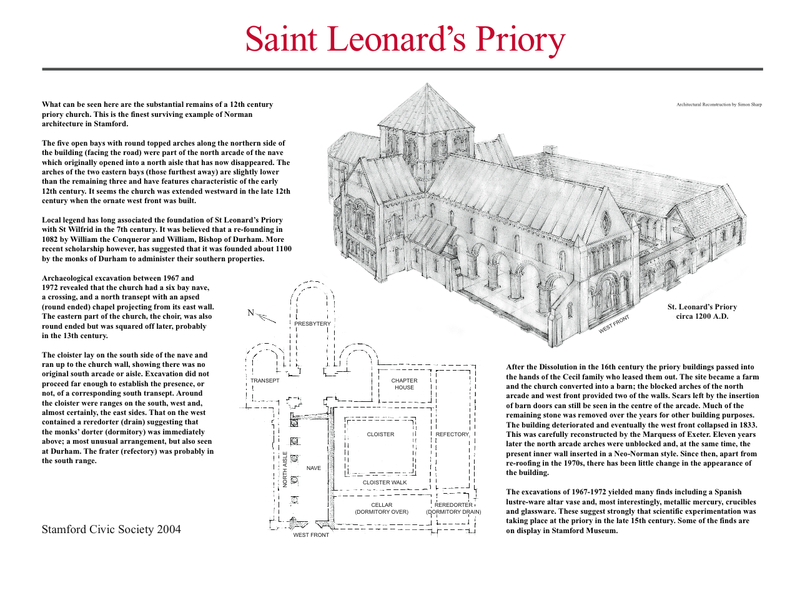 St. Leonard's Priory is the responsibility of SKDC, but the Civic Society has long taken an interest in looking after it, and has been responsible for a number of projects to clean it and make it more accessible. The grounds are open to the public and entry is through the gates from Priory Road. The building itself forms a "lock-up" and in fact there is little to see inside. The location now forms an attractive medieval site, thanks to the work carried by the Civic Society in 2003-4 involving the installation of two benches, notice and the interpretation board, that explains the site in detail. Since then, a large number of spring bulbs and a mulberry tree have been planted to enhance the site. Regular grass cutting carried out by SKDC keeps the site looking good in summer. The main medieval architectural attractions are the five 12 C. circular arches and the Gothic west front which was rebuilt in 1833 by the 2nd Marquis.